KIEV, April 8./TASS/. 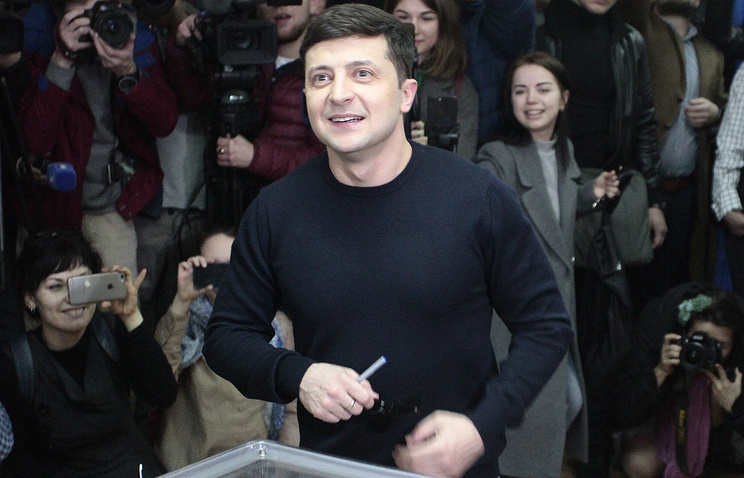 Most of the voters who supported the candidates dropping out of the presidential race, plan to cast their votes for candidate from the Servant of the People party Vladimir Zelensky during the runoff election, suggests Deputy Director of Ukraine’s Razumkov Center for Economic and Political Studies, Mikhail Mishchenko. "The electorate of top-rated politicians who failed to qualify for the second round, tends to rather vote for Zelensky than for incumbent President Pyotr Poroshenko," he told a news conference on Monday, citing an opinion poll carried out ahead of the first round. However, an appeal from the candidate himself will greatly influence the position of the voters or this or that politician, the expert stressed. According to Mishchenko, 35% of the voters supporting the Opposition Platform - For Life Party leader Yuri Boiko plan to vote for Zelensky, and only 2% are ready to vote for Poroshenko. Every fourth Ukrainian voting for Civil Position leader Anatoly Gritsenko, is expected to vote for Zelensky in the runoff, and 19% - for Poroshenko. Forty-one percent of the voters supporting Batkivshchina Party leader Yulia Timoshenko in the first round may now vote for Zelensky and ten percent - for Poroshenko. As for the voters of Radical Party leader Oleg Lyashko, the ratio is 32% to 16% in favor of Zelensky.